Sources listed in parentheses are found in the Bibliography. If you would like to make any additions or corrections to the information posted, please e-mail me. Read a description of Adna published in "The Chronicle", May 1909. Entry for Adna in the "Oregon, Washington and Alaska Gazetteer and Business Directory, 1901-1902"
Located 7 miles north of Napavine. It was named for the agate stones which are still abundant in the area. The post office operated from June 7, 1890 to Dec. 14, 1901 (Ramsey, p. 79). The Agate School District operated from 1901 to 1937 (Nix, p. 41). Entry for Agate in the "Oregon, Washington and Alaska Gazetteer and Business Directory, 1901-1902"
Several locations south of Winlock shared the name of Ainslie. The original settlers in this area, David G. and Agnes Ainslie, owned a large plat along Olequa Creek. David G. Ainslie established the Ainslie Post Office on Feb. 11, 1887, which was located about 1.5 miles south of Winlock (Ramsey, p. 69). In 1889, Ainslie deeded 210 sq. ft. of his land to the Ainslie School District No. 47. In 1890, he and Agnes sold their entire property to the Ainslie Lumber Co., which operated the Ainslie Mill and Town. The Ainslie Post Office was discontinued June 24, 1897 (Ramsey, p. 69). A second community of Ainslie was located further south, near present-day Vader. It is thought that locals also called this community Capitola. The Establishment of Ainslie - collection of deeds and maps showing the location of David G. Ainslie's property, and the subsequent town and community of Ainslie. Contributed by Don Olsen. Entry for Ainslie in the "Oregon, Washington and Alaska Gazetteer and Business Directory, 1901-1902"
Ainslie Community Gathering, ca. 1910/1911 - large photo submitted by Don Olson, along with some identifications. Includes many (if not most) of the residents of Ainslie Community at that time. Ainslie-Winlock Families - photographs and historical information on several Ainslie-Winlock families, including the Hendersons, Isaacsons, Olsons, Snows and Toys (contributed by Don Olson). Located 11 miles southwest of Morton on US Hwy 12. In 1914, Ghosn Ghosn (yes, that was his name) named it for his native town of Ajlun along the Jordan River, thought to be the site of the oldest Christian church in the world. Ghosn was the town's first postmaster, and the post office operated from June 29, 1914 to Dec. 27, 1968 (Ramsey, p. 140). A Biography of Ghosn Ghosn - published as part of the "History of Lewis County", by Alma Nix and John Nix, 1984 (use the "find" feature of your web browser to locate the biography). Notes from Ajlune, published in "The Advocate", 28 Nov 1940. A post office was established here by Charles B. McGrady on Feb. 24, 1875 and discontinued Nov. 24, 1875. The town's location and history are unknown (Ramsey, p. 45). Located 19 miles southeast of Chehalis on the north fork of the Newaukum River. Other names were Shoestring, Tilton, and Alpha Prairie. According to the Bicentenniel Edition of The Daily Chronicle (July 1976, p. C18), it is thought Alpha was named by Harold Hanson, who settled there in 1868. A post office operated from June, 1890 to July, 1954 (Ramsey, p. 82). Entry for Alpha in the "Oregon, Washington and Alaska Gazetteer and Business Directory, 1901-1902"
Located 3 miles south of the former town of Riffe, near Mayfield Dam. A post office operated from 1913 to 1920. From 1926-1927, its name was changed to Montgreen (Ramsey, p. 139). For a brief time, it was a station on the South Bend line of the Northern Pacific Railway, located between Littell and Bunker. See Carl Staeger's article about the South Bend line. According to an obituary for Edward J. Donovan, there was an Apex Timber Company that operated two miles north of Pe Ell. Located 4 miles north of Adna. This was actually a station along the Chehalis Western Railroad, which had its own post office from June 11, 1890 to April 30, 1891 (Ramsey, p. 89). Entry for Banyan in the "Oregon, Washington and Alaska Gazetteer and Business Directory, 1901-1902"
Located between Ethel and Salkum. Read about the Flag-Raising Ceremony at Bennett School, in the Ethel School District, in 1914. Located 4 miles from Kopiah, on the Eastern Railway & Lumber Company's line. According to an article in The Centralia Daily Chronicle, Bennight was a coal mining town, named on 11 Dec 1913 in honor of J. E. Bennight. Entry for Bennight in Meany's "Origin of Washington Place Names". Washington Coal & Mining Company - newspaper article from 27 Sep 1913 describing the expansion of the Washington Coal & Mining Company's operations at Bennight. D. Jeffrey Bennight provided more information about the Bennight mine's location on the Bennights Unite blog. Located west of Morton, near Bremer, Bergen was the name given to a school (old School District No. 127, the Bergen School) and a bridge. Named for Thomas Bergen, who homesteaded here in 1899 (Sparkman, p. 70-71). 1900 Census, Tilton Precinct - complete transcription of the Tilton Precinct, which included the Bergen homestead. Big Bottom was in the vicinity of present-day Randle; today the Big Bottom Voting District comprises much of eastern Lewis Co. The Big Bottom Trail runs between Randle and Morton (Sparkman, p. 39). This railroad station, established in 1913, was named for E. L. Blakeslee, who owned a sawmill in this area. Here is a picture of the junction. Boistfort is located 15 miles southwest of Chehalis on the fork of the Chehalis River. It was originally named Bawfaw but was renamed by the new settlers (Tisdale, p. 126). Pierre Charles (namesake of Pe Ell) named it for the French "boisfort", meaning strong wood or heavy forest (Ramsey, p. 19). The area was settled in the mid-1850s by the Goff brothers, A. F. Tullis, J. H. Fay, James Mallis, and the the Purcell, Hogue, Roundtree, Buchanan, White, Stillman, and Newland families (Hunt and Kaylor, p. 449). T. W. Newland arrived in 1852/3 with his family, and was the county's first superintendent of schools. His wife was the country's first schoolteacher when the first school was established in 1853 (Hunt and Kaylor, p. 449). The Boistfort school district was the first school district established in Lewis County (Hunt and Kaylor, p. 451). Boistfort schools are now part of the combined Boistfort/Curtis School District. For more information, see the listing for Boisfort in Meany's "Origin of Washington Place Names". Entry for Boistfort in the "Oregon, Washington and Alaska Gazetteer and Business Directory, 1901-1902"
See a photo of the Baw Faw (Boistfort) Fire Lookout which was in use from 1919 to about 1960. Located on SR 508 8 miles west of Morton, along the Tilton River. In 1884, the post office was established as Tilton. The town and post office were renamed in honor of George Bremer in 1890. On February 3, 1923, the post office was moved to Cinebar (Ramsey, p. 80). Entry for Bremer in the "Oregon, Washington and Alaska Gazetteer and Business Directory, 1901-1902"
Located south of Chehalis. A post office operated here from Dec. 14, 1892 to June 22, 1895 (Ramsey, p. 100). Located 3 miles west of Adna on the Chehalis River. A post office opened June 25, 1890 as Eagleton. The town was renamed in honor of John Elijah Bunker, and the Bunker post office operated from May 29, 1913 to July 30, 1921 (Ramsey, p. 138). There were at least two saw mills in the area, including one operated by Hill Logging Co. When the sawmill and shingle mill shut down, Bunker was abandoned. "Hard Hit By Flu" - article about impact of Spanish influenza on logging camp at Bunker. Fire at Hill Logging Company (1919), as described in the publication "Safety Engineering". Newspaper Articles about Hill Logging Company - contributed by Rich Detering. Located 2 miles south of Mineral, off SR 7 on Mineral Hill Road. It was once the site of a sawmill and logging camp, but is now vacant except for an electric power plant. Located 6 miles southwest of Adna on the Northern Pacific railway. The Northern Pacific named the town after Ceres, the Roman goddess of agriculture. The post office operated here from Aug. 14, 1908 to May 29, 1931 (Ramsey, p. 132). For more information, see the listing for Ceres in Meany's "Origin of Washington Place Names". Entry for Ceres in the "Oregon, Washington and Alaska Gazetteer and Business Directory, 1901-1902"
Notes from Ceres Hill, published in "The Advocate", 16 Apr 1940. Located on SR 508 25 miles east of Chehalis, between the Cinnabar Creek and Tilton River. It was named for the cinnabar ore deposits found in the area, which were mined for sulphide of mercury in the early 1900s. The post office, also the home of the postmaster, is located on the south side of the highway. Entry for Cinebar in the "Oregon, Washington and Alaska Gazetteer and Business Directory, 1901-1902"
Notes from Cinebar, published in "The Advocate", 22 Aug 1940. Located 5.5 miles southeast of the former site of Kosmos in the Cispus River Valley. Henry and Bertha Koher, German immigrants, settled in this area and established the post office on March 23, 1908. The PO was discontinued Feb. 9, 1927 (Ramsey, p. 129). View a map of Cispus, from the Lewis County Public Works Dept. Road Atlas. Located 3 miles southwest of Chehalis along SR 6. It was founded in 1852 by Lewis H. Davis and named Davis Prairie. Davis founded the Davis Prairie Post Office on May 10, 1858, which was renamed Claquato on Sept. 15, 1858 (Ramsey, p. 16). The Davis family owned 1,000 acres of land here, and built a courthouse, flouring mill, and sawmill operated by one man (Hunt and Kaylor, p. 448). In 1857, Lewis Davis commissioned Henry H. Stearns to plat the town of Claquato (Nix, p. 7). [Editor's note: Gary Allin provided the following correction to the information from Nix's "History of Lewis Co., WA": "The man Mr. Davis commissioned to survey Claquato was Henry Noble Stearns. He also helped start Adna. He is buried in the Claquato Cemetery near Mr. Davis. Stearns Creek, Stearns Road, Stearns Hill and Stearns Hill Road are named after him." (more information)] Claquato served as the Lewis county seat from 1852 to 1873, when it was moved to Chehalis. The Claquato School District was one of the original five school districts in the county, begun in the latter 1850s (Hunt and Kaylor, p. 451). Other early settlers of Claquato included J. T. Browning who served as postmaster, store keeper, dentist, and doctor. A. F. Gordon was the town blacksmith and farmer. Thomas Pearson was a carpenter and probate judge, while J. D. Clinger was a wheelwright and justice of the peace. Elkanah Mills owned a hotel, stage station and ferryboat (Hunt and Kaylor, p. 458). In 1864, the population of Claquato was about 40-50 people (Hunt and Kaylor, p. 458). After the county seat was moved to Chehalis, much of Claquato's population moved as well. In 1903, the post office was discontinued and moved to Littell (Ramsey, p. 16). The Claquato Church, a Presbyterian church built in 1856, is now a historical site (Nix, p. 6). The biography of Henry C. Davis, son of Lewis H. Davis, provides extensive information about the founding and settlement of Claquato. For more information, see the listing for Claquato in Meany's "Origin of Washington Place Names". Entry for Claquato in the "Oregon, Washington and Alaska Gazetteer and Business Directory, 1901-1902"
"A Brief Look at the Rich History of the Claquato Church and Cemetery" - article written by Andy Skinner for The Chronicle (2 Feb 2018). This precinct appears in the 1900-1930 censuses (possibly later censuses as well?). Although I have been unable to find any information on the namesake of Clark precinct, or even the exact boundaries of Clark, Ches Packer notes that in the 1920 census, the first families listed were enumerated along South Tower Avenue, starting at the intersection with W. Summa St., which places Clark in present-day south Centralia. Located 5 miles north of Toledo (or 4 miles southwest of Ethel). H. Clay Fleenor named the town for himself and established a post office on June 11, 1890, which was discontinued July 24, 1891 (Ramsey, p. 90). Entry for Clay in the "Oregon, Washington and Alaska Gazetteer and Business Directory, 1901-1902"
Settlement located along Coal Creek, directly east of Centralia. Located 8 miles east of Randle in the Gifford Pinchot National Forest, off of US Hwy 12. Levi Adrian Davis, son of Lewis H. Davis (founder of Claquato), settled the town around 1888, and was its first postmaster. Ramsey (p. 88) and the biography of Levi's brother, Henry C. Davis both state that the town's namesake was Levi's neice, Cora M. Ferguson Patterson. [Another source stated that the town was named for Levi's wife, Cora, but in fact Levi was married to Mary Jane King]. A post office operated from June 11, 1890 to Nov. 30, 1908 (Ramsey, p. 88). The biography of Henry C. Davis, brother of Levi A. Davis, provides more information about the founding of Cora. For more information, see the listing for Cora in Meany's "Origin of Washington Place Names". Entry for Cora in the "Oregon, Washington and Alaska Gazetteer and Business Directory, 1901-1902"
A name given to many locations in southwest Washington. Its name comes from the Indian term, "capturing the medicine spirit." For more on the origin of Cowlitz, see Meany's "Origin of Washington Place Names". Located near Toledo on the Cowlitz Prairie. The "new" Cowlitz post office (as opposed to "old" Cowlitz, now Toledo) was established by Horace Pinto on Feb. 3, 1881, and discontinued April 14, 1906 (Ramsey, p. 56). Entry for Cowlitz in the "Oregon, Washington and Alaska Gazetteer and Business Directory, 1901-1902"
Cowlitz Bend is an election precinct in Lewis County, established prior to the 1920 census. Although I do not know its exact location, it was most likely near present-day Toledo. Update (May 2017): Dan Meyer provided additional information on Cowlitz Bend's location: "I see on the Lewis County GenWeb page the the exact location of the Cowlitz Bend Voting precinct was not known. Just for your information the names that are on the 1940 census sheet were people that lived on either side of the Cowlitz River in the southern most part of Lewis county. On the east side of river, these people lived on what is now Mandy Rd, Rodgers Rd, Imboden Rd, and Barnes Drive north of Cowlitz County line. On the west side they were in Lewis County north of Olequa on what is now Westside HWY and HWY 506 to just past I-5. Looking at a map, Cowlitz Bend is the 90' bend the Cowlitz river makes just east of Vader." Located "five and a half miles northeast of Morton on the Morton to Elbe Highway. It was once a junction for traffic on the Tacoma Eastern Railway with the Elbe Lumber Company Railroad." (source: Tacoma Public Library's Washington Place Names database). 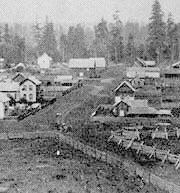 Present-day precinct, located 4 miles south of Mossyrock. Located on Crego Hill 4 miles southeast of Adna (and due east of Curtis), Crego was named for Charles and Olive Crego, the first postmaster. The post office operated from Feb. 28, 1901 to June 15, 1907 (Ramsey, p. 117). Curtis is a small community located 11 miles southwest of Chehalis, near Boistfort. It was named for Benjamin L. Curtis, its first postmaster. For more information, see the listing for Curtis in Meany's "Origin of Washington Place Names". This town is not listed in Guy Ramsey's book, but on Cram's 1909 WA map it appears along the current SR 7, between Mineral and Morton. The Bevan family and Ben Smith were among those that lived "on the Divide" (Sparkman, p. 120). Located 19 miles west of Chehalis on the Chehalis River, off SR 6. The town is named after Chauncey Albert Doty, who founded the Doty Lumber and Shingle Company here in 1896. By 1916, Doty had 1,000 residents, a grade school, high school, dance hall, and large community hall. The company folded in 1929, and today only 20 families are left in Doty (Erickson, p. 49). For more information, see the listing for Doty in Meany's "Origin of Washington Place Names". Entry for Doty in the "Oregon, Washington and Alaska Gazetteer and Business Directory, 1901-1902"
Consolidation of Doty School District (1912) - article in The Centralia Weekly Chronicle. A prairie located 3 miles west of Toledo. Named for George and Caroline Drew, who owned a 636-acre donation land claim in this area. Located 2 miles west of Doty off SR 6. Its original name was Salal. Its name comes from the dryad, a nymph which lives in oak trees. The town was founded by the Northern Pacific railway in 1900; in 1902, the Leudinghaus Sawmill opened. Until 1930, its population was about 500. The company closed down in 1930, and Dryad is now a community of about 50 people (Erickson, p. 47). For more information, see the listing for Dryad in Meany's "Origin of Washington Place Names". Entry for Dryad in the "Oregon, Washington and Alaska Gazetteer and Business Directory, 1901-1902"
Entry for Salal in the "Oregon, Washington and Alaska Gazetteer and Business Directory, 1901-1902"
"These Walls Do Talk - Old Churches Tell the History of Lewis county" - article by Nancy Keaton that features several historic church buildings, including Dryad Community Baptist Church. Located 1/8 mile south and 1/4 mile east of Toledo. It was also known as East Toledo. Its name is derived from Eden, supposedly a reference to the namer's view of of the landscape. The post office operated from Aug. 2, 1888 to Sept. 16, 1892 and served at most 50 residents (Ramsey, p. 71). Entry for Eadonia in the "Oregon, Washington and Alaska Gazetteer and Business Directory, 1901-1902"
Located in upper Bunker Creek valley about 9 miles north-west of Adna. The post office was established on June 25, 1890, and was discontinued on June 15, 1920. The mail was then sent from Chehalis (Ramsey, p. 91). See also Bunker. Entry for Eagleton in the "Oregon, Washington and Alaska Gazetteer and Business Directory, 1901-1902"
This town is not listed in Guy Ramsey's book, but on Cram's 1909 WA map it appears along the current SR 7, just south of Mineral. Also known as Layton Prairie and Knab. Located east-northeast of Toledo. No further information available. Entry for Eden Prairie in the "Oregon, Washington and Alaska Gazetteer and Business Directory, 1901-1902"
Located 15 miles southeast of Chehalis on US Hwy 12, midway between Marys Corner and Salkum, near Lacamas Creek. Its first postmaster, in 1886, was Paul Lindeman (Ramsey, p. 66). For more information, see the listing for Ethel in Meany's "Origin of Washington Place Names". Entry for Ethel in the "Oregon, Washington and Alaska Gazetteer and Business Directory, 1901-1902"
Evaline is a small community located 3 miles north of Winlock. The earliest white settlers in this area were the Urquharts and the MacDonalds (Hunt and Kaylor, p. 448). Sedate W. Porter (b. Feb. 12, 1867, PA; d. March 10, 1927, Lewis Co., WA) founded the town and established the post office on Feb. 14, 1906. The PO was discontinued Nov. 15, 1930 (Ramsey, p. 125). The Evaline School district was founded in 1883, and serves the two-room Evaline Elementary School (grades K-6). Middle school and high school students are bused to Winlock (Nix, p. 41). For more information, see the listing for Evaline in Meany's "Origin of Washington Place Names". Located west of Adna at the junction of Deep Creek and Bunker Creek. It was settled in 1864 and named for Joel H. Fay, an early settler at nearby Claquato. The post office operated from May 18, 1880 to Sept. 16, 1895 (Ramsey, p. 52). Entry for Fayette in the "Oregon, Washington and Alaska Gazetteer and Business Directory, 1901-1902"
A Finnish settlement located 2 miles northeast of Vader and five miles south of Winlock; the Saarinens were one of the families who settled here. Flynn appears on Cram's 1909 WA map it appears along the current SR 7, just north of Mineral. This district was located 3 miles west of Mineral, and was settled early on by the Loden and Hale families. Named for Michael Flynn, the nearest homesteader to the flag stop erected here by the Tacoma-Eastern Railroad. The Flynn schoolhouse, which went through grade 8, was built in 1910 near the end of Mineral Creek Road (Sparkman, p. 105). Also spelled Foron. According to the US Geological Survey, Foran was loated in Township 15N, Range 2W, Section 30, about five miles south of the Lewis-Thurston county border. The location is now occupied by Interstate-5. The only remnants left is Foron Road, which runs north-south in northwest Lewis County, between the Lewis-Thurston county border and Fords Prairie. For more information, see the listing for Foran and Foron in Meany's "Origin of Washington Place Names". (1990 population: 2,480) Located one mile northwest of Centralia on the Chehalis River. Named for Judge Sidney S. Ford who, with his wife Nancy, settled on a 640-acre donation land claim in 1846 (Berberich, p. 72). Judge Ford befriended the local Quiyaisk Indians, who called the place Tasunshun (Berberich, p. 72). Other early settlers included George Waunch (1845), Joseph Borst (1846), James Tullis, John Shelton, J. K. Lum, Mr. Ferdinand, Mr. Chable, the Ward family, and the Brown family (Hunt and Kaylor, p. 450). The Borst blockhouse, built as protection against Indian raids but never used, is now a historical site. "The Family of Sidney S. Ford, Senior" by Tove Hodge - posted as part of "The Family History of Raymond and Corinne Blakeslee." Detailed history of this pioneer Ford family, with ties to both Lewis and Thurston counties. (Link points to PDF file). For more information, see the listing for Ford's Prairie in Meany's "Origin of Washington Place Names". Located 7 miles south of Chehalis. The post office was established Nov. 16, 1896 by Mrs. Amanda Munroe, its first postmaster. The PO was discontinued March 31, 1934 (Ramsey, p. 104). For more information, see the listing for Forest in Meany's "Origin of Washington Place Names". Entry for Forest in the "Oregon, Washington and Alaska Gazetteer and Business Directory, 1901-1902"
Where is Forest, Washington - Luke Broersma's blog post detailing his efforts to trace his family's move to Forest, WA. Forest(?) School, ca 1909 - contributed by Luke Broersma. Consolidation of Forest School District (1910) - article in The Centralia Weekly Chronicle. News from Forest, published in "The Lewis County Advocate", 1 May 1934. This town is not listed in Guy Ramsey's book, but on Cram's 1909 WA map it appears southwest of Mineral. The family of Christian Fritz were early settlers in this area (Sparkman, p. 92). Located 4 miles northwest of Centralia near Lincoln Creek. It was originally called Lincoln but was renamed for John Galvin, who founded the town in 1911 (Ramsey, p. 139). Established on June 3, 1907. Located at the terminus of Tacoma Eastern (now Milwaukee Road) Railroad five miles north of Morton. Discontinued mail on September 30, 1910. Also known as Lindberg (Ramsey p. 128). Establishment of Glenavon Post Office - article in "The Centralia Chronicle", 17 Oct 1907. Located 13 miles northwest of Centralia (9 miles north of Galvin), near Lincoln Creek. The post office was established Aug. 16, 1871 by Joseph W. Ingalls, who operated the post office out of his log farmhouse with his wife. The post office was discontinued March 30, 1907 (Ramsey, p. 31). Located 8 miles southeast of Morton on US Hwy 12, on Uden Frost Creek. Its original names were Vern and Verndale. Beverly W. Coiner renamed it Glenoma, combining "glen" (valley) with "oma" (Greek for fruit) into "fruitful valley" (Nix, p. 38). For more information, see the listing for Glenoma in Meany's "Origin of Washington Place Names". Entry for Verndale in the "Oregon, Washington and Alaska Gazetteer and Business Directory, 1901-1902"
News from Glenoma, published in "The Chehalis Advocate", 26 Nov 1959. Granite was located at present-day Onalaska. Before the Carlisle Lumber Co. bought up the land for their saw mill and renamed the town Onalaska, several families homesteaded here in the 1880s and 1890s, including the Graves, Arnolds, Jorgensons, Randalls and others (see "The History of Onalaska" for more information). This precinct is listed in the 1910 census, but I have no further information for this locale. Currently, there is a Greenwood precinct that occupies the northwesternmost corner of Lewis County, near the border with Grays Harbor, Pacific and Thurston counties. Also known as Guerrier Prairie. Located 11 miles southeast of Chehalis on the Cowlitz, Chehalis and Cascade Railway. Named for Theophilus and Lucy (Hapwood) Hanaford who settled there in 1867. Harmony is west of Morton on Hwy 12, near Mossyrock. Ernest Burchard was the first postmaster, and the post office operated from Feb. 14, 1890 to Feb. 15, 1924 (Ramsey, p. 74). It is home to St. Yves Catholic Church and cemetery. The first Catholic mass in the Tilton River valley was held at St. Yves. Father Ewald, a Franciscan missionary from the Cowlitz Mission, held masses here every 5th Sunday until Sacred Heart opened in Morton in 1922 (La Gra, p. 66). It is also the main point of access to Ike Kinswa State Park, at Mayfield Lake, where a number of early pioneers are buried. Entry for Harmony in the "Oregon, Washington and Alaska Gazetteer and Business Directory, 1901-1902"
Notes from Harmony, published in "The Advocate", 22 Aug 1940. Located on the Lewis County-Thurston County line, 11 miles northeast of Centralia. Mrs. Mary A. Jackson Hurn established the post office here on April 14, 1900. In 1907, Hurn was transferred to Thurston County and renamed Tono (Ramsey, p. 114). Entry for Hurn in the "Oregon, Washington and Alaska Gazetteer and Business Directory, 1901-1902"
Established in Thurston County May 13, 1878. This post office crossed the county line by just a few feet. Transferred to Lewis County September 13, 1890. In Lewis County it was situated along Independence Creek, in the very easternmost corner of the little knob that the county makes at its northwest corner, about 5 miles southwest of Rochester, Washington (Ramsey, p. 93). Entry for Independence in the "Oregon, Washington and Alaska Gazetteer and Business Directory, 1901-1902"
Now a museum, Jackson House is located just south of Marys Corner on what was once called the Highland Prairie and Jackson Prairie. It was built by John Robinson Jackson, who immigrated to the U.S. from Yorkshire, England. He lived first in Missouri, then came to Oregon by way of the Oregon Trail in 1844. In 1845, he settled in Lewis County. He was the first county sheriff, the first county assessor, and first tax collector. The first term of county court was held at his house in 1845 and hence Jackson House was the first county seat of Lewis County, until it was moved to Claquato in 1852 (Hunt and Kaylor, p. 450). His home was also the site of the first federal court in Washington Territory on Jan. 1, 1854. In addition, Jackson was the first and only postmaster of Highland, from April 18, 1854 to Dec. 5, 1864 (Ramsey, p. 5). For more information, see the listing for Jackson Prairie in Meany's "Origin of Washington Place Names". News from Jackson Prairie, published in "The Lewis County Advocate", 25 Mar 1932. Located 13 miles southwest of Chehalis on the south fork of the Chehalis River. It was named for Herman Klaber, whose hops farm was rated the largest in the world from 1912-1922 (Nix, p. 40). He drowned in the sinking of the Titanic in 1912. Located 6 miles west of Onalaska on SR 508, and 9 miles south of Chehalis on the Cowlitz, Chehalis and Cascade Railway.. This small community is located 5 miles east of Toledo. A post office operated here from May 23, 1888 to July 31, 1935 (Ramsey, p. 71). Entry for Knab in the "Oregon, Washington and Alaska Gazetteer and Business Directory, 1901-1902"
Located 6 miles southeast of Forest. A post office operated here from March 21, 1905 to Sept. 13, 1913 (Ramsey, p. 124). Located 8 miles southeast of Centralia. A post office operated here from June 13, 1906 to Nov. 15, 1928 (Ramsey, p. 126). 1930 Census, Kopiah Precinct - complete transcription. Located 8 miles southeast of Morton along US Hwy 12. Its original name was Fulton, but the source of Kosmos is unknown. Kosmos was once the headquarters of the logging operations for U. S. Plywood Corp. Another primary industry was the mining of mercury. Kosmos was drowned by Davisson Lake, created by Tacoma City Light in 1969 (Miller, 1977). Entry for Fulton in the "Oregon, Washington and Alaska Gazetteer and Business Directory, 1901-1902"
Jeff Steiner's website (original no longer available, so this link points to a snapshot on the Internet Archives) - lots of pictures of Kosmos, Riffe Lake and surrounding areas, taken when the lake was at a record low level. "Receding waters allow glimpse of lost logging town" - article published in The Seattle Times in 2008 that describes the reappearance of Kosmos. Located 3 miles east of Onalaska (3 miles northwest of Salkum) at the head of Lacamas Creek. Also known as Lacamas Corner. Lacamas is named for the edible root camassia, or camas, which grows in the area. "La" was added in front of camas to distinguish it from Camas, a city in Clark County, WA. The main employer was a sawmill, which closed in the mid-1920s. The post office operated here from Oct. 5, 1918 to Sept. 30, 1926 (Ramsey, p. 142). See "The History of Onalaska" for more information. This coal mining town, three miles west of Mineral, was destroyed by landslide in 1919. The coal mine was established by William Ladd and John Bagley in 1904 to provide coal for locomotives. At the height of production, the mine shipped out 100 tons of coal a day. A post office operated here from 1907 to 1914, named for W. M. Ladd. Charles Winsberg was the first postmaster, and D. W. Watkins was the 2nd and last postmaster. One of the families that lived here, and described by L. Sparkman, was that of Bill Bevan. (Sparkman, p. 118-121). For more information, see the listing for Ladd in Meany's "Origin of Washington Place Names". Located 5 miles southeast of Ethel. Mrs. Betsey S. Hackett established the first post office here on Oct. 10, 1882, which was discontinued on March 31, 1894 (Ramsey, p. 57). Entry for Ladew in the "Oregon, Washington and Alaska Gazetteer and Business Directory, 1901-1902"
Located 4 miles northeast of Morton on SR 7. It was founded by Gustaf Lindberg of Tacoma in 1911 as the company town of Linco Log and Lumber Co, and included a sawmill and railroad serving the mill (Erickson, p. 79). The town was originally named Coal Canyon. When it burned down in 1918, it was rebuilt and renamed Lindberg after Gustaf Lindberg. It reached its peak population of about 200 in the 1920s (Erickson, p. 79). Lindberg lost ownership of the town and it was renamed Millberg. The Tacoma Eastern railway referred to the town as Glenavon. Today, the town no longer exists except for the ruins of the mill, brick cottages, and company store on the east side of SR 7 (Miller, 1977). For more information, see the listing for Lindberg in Meany's "Origin of Washington Place Names". Located west of I-5 on SR 6, near Claquato. The post office was moved here from Claquato on Feb. 21, 1903 (Ramsey, p. 16). According to a 1912 article in The Centralia Daily Chronicle, Harold J. "Harry" Syverson claimed to have founded Littell. It was an old sawmill town on the Northern Pacific line, now abandoned (Erickson, p. 46). Post office established here on June 24, 1874. Location is the same as that of current Vader. "Little Falls" was named for the small waterfalls along Olequa Creek in southwest Lewis county. For a time, the post office was also called Sopenah. In response to the railroad's request to change the name from Little Falls (there being too many locations with "Little" in their name), residents settled on "Soapstone". This was in reference to the soapstone shelf over which the waterfalls of Olequa Creek fell. Since Soapstone was too much like Soap Lake in eastern Washington, the railroads changed it to "Sopenah" (Steinhaus, p. 4). In 1913, Little Falls was renamed Vader. The first school at Little Falls was established in 1881, and served 3 families (16 children) (Steinhaus, p. 5). Lucien J. Cravat operated a general store at Little Falls until his death in 1887 (Steinhaus, p. 25). Entry for Little Falls in the "Oregon, Washington and Alaska Gazetteer and Business Directory, 1901-1902"
Entry for Sopenah in the "Oregon, Washington and Alaska Gazetteer and Business Directory, 1901-1902"
This precinct (also known as Logan Hill) is located southeast of Chehalis. From the census, a large percentage of Logan in 1910 was of German or Bohemian descent. No further information available. News from Logan, published in "The Lewis County Advocate", 20 Apr 1934. News from Logan Hill, published in "The Chehalis Bee-Nugget", 20 Nov 1931. News from Logan Hill, published in "The Chehalis Bee-Nugget", 1 Jan 1932. For a brief time, it was a station on the South Bend line of the Northern Pacific Railway, located between Bunker and Ceres. See Carl Staeger's article about the South Bend line. An article in the Summer 2006 issue of the "Sou'wester" briefly descibes the location of Long's Crossing.